The 4th International HEPPA Workshop (High-Energy Particle Precipitation in the Atmosphere) will take place in conjunction with the SOLARIS (Solar Influences on SPARC, Stratospheric Processes and their Role in Climate), from 9th to 12th October 2012, at the National Center for Atmospheric Research, Boulder, Colorado, USA. From the organisers: "Please join us for a four-day workshop focused on observational and modeling studies of the influences of solar radiation and energetic particle precipitation (EPP) on the atmosphere and climate. The meeting will last four full days, beginning Tuesday morning, 9 October. Broad topics to be covered include the causes and phenomenology of solar radiation and energetic particle variability, mechanisms by which radiative and particle forcing affect atmospheric chemistry and dynamics, contributions of solar and EPP forcing to climate variability and space weather, and the current state of the art and outlook for relevant observations and models." "Format: Because of the interdisciplinary nature of this workshop, there will be several plenary sessions during which invited tutorials and overview talks will be geared toward the general audience. All contributed presentations will be given in the form of posters, for which individual, sequential sessions will be scheduled. All contributors will be given the opportunity to present a one-slide summary of their posters in the oral plenary sessions. Lively discussions will be encouraged, with abundant time for collegial interactions during poster sessions. The last day of the meeting will be reserved for the HEPPA and SOLARIS model/measurement inter-comparison working groups, which are open to all interested participants." Please refer to the meeting web pages for more information. Registration and abstract deadline is 17th August 2012. Solar Influence on Global and Regional Climate, by M. Lockwood, Surv. Geophys., 2012, DOI 10.1007/s10712-012-9181-3, http://www.springerlink.com/openurl.asp?genre=article&id=doi:10.1007/s10712-012-9181-3, review article. Investigating the performance of neural network backpropagation algorithms for TEC estimations using South African GPS data, by J. B. Habarulema and L.-A. McKinnell, ANGEO, 2012, Vol.30, pp. 857-866, SRef-ID: 1432-0576/angeo/2012-30-857, http://direct.sref.org/1432-0576/angeo/2012-30-857. Source: COSIS.net Alert Service Subscriptions, and thanks to M. Lockwood for the link. In the near future the EISCAT Scientific Association will face a major instrumental upgrade with the ESFRI Roadmap project "EISCAT_3D: A European Three-Dimensional Imaging Radar for Atmospheric and Geospace Research." 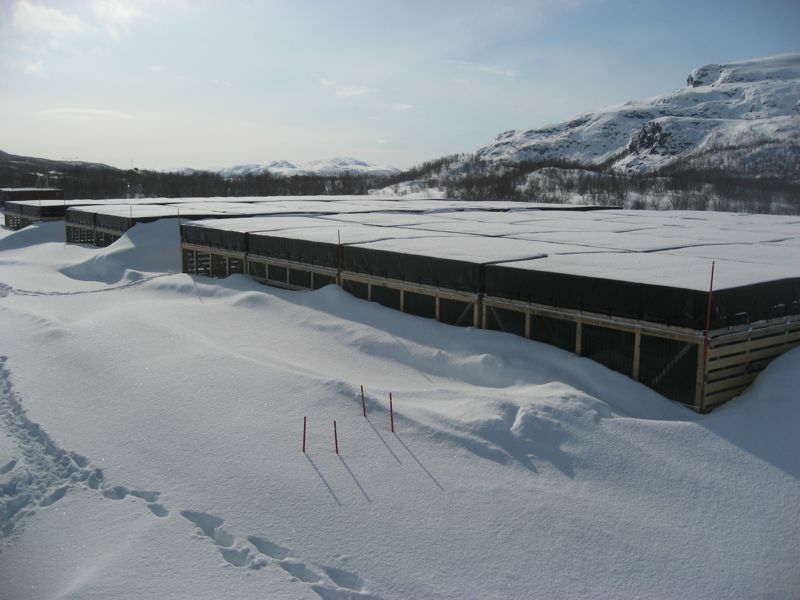 EISCAT, in co-operation with the Sodankylä Geophysical Observatory (SGO), will run a training course for new users of the EISCAT radars, from 27th August to 1st September, 2012 (Monday to Saturday). 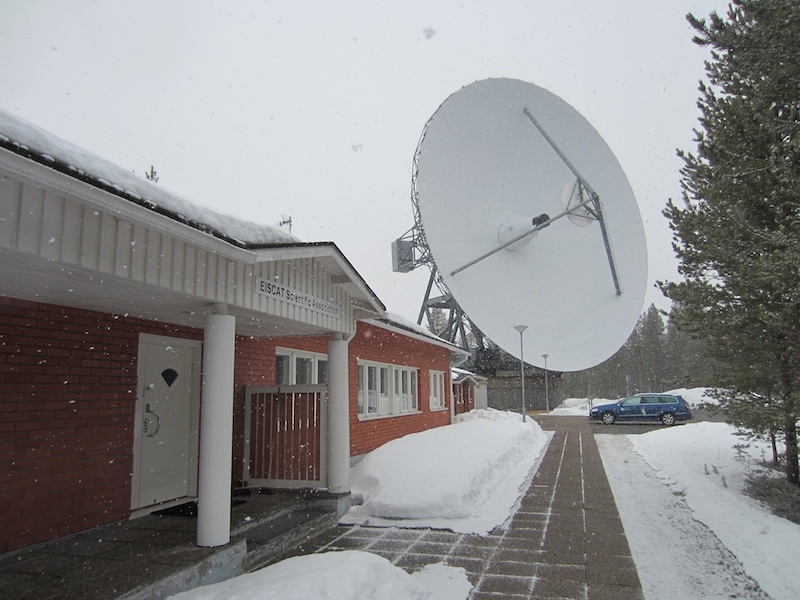 The training course will be held at Sodankylä, where one of the EISCAT UHF remote sites is located. The course will cover all essential aspects of the current EISCAT systems, including their science programme. An overview of the existing hardware and software will be provided and future plans will be discussed, with a strong emphasis on EISCAT_3D. Tips on analysing and working with the data will be given and the participants will run an own radar experiment in a hand-on exercise. The lecturers comprise members of the EISCAT staff and experienced scientists from the user community. As well as providing a good foundation for new EISCAT users, the course will also provide a chance for more established users to be updated on the latest and future developments. The deadline for registration in the course is 26th June, 2012. For more information please visit http://www.sgo.fi/Events/RS2012/. 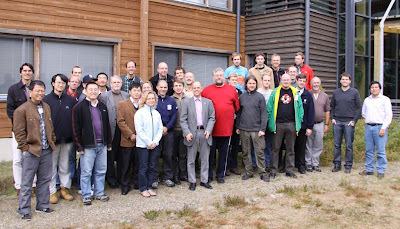 Photo of participants and teachers of the International EISCAT Radar School 2010, which was held at Sodoankylä, too, by Jyrki Manninen. The EISCAT_3D User Meeting has come to a close. Sorry for the lack of updates today, but for some reason the wireless network at Ångström Lab became unavailable during the final session this morning. As mentioned, please check the meeting programme as well as the collection of presentations on-line. The latter will be updated when more contributions become available, most are there already. Note that the next EISCAT_3D User Meeting will take place 6th to 8th May 2013, at Ångström Lab, Uppsala, Sweden. A big "Thank You!" goes to Stephan Buchert for arranging the past four User Meetings, and for being ready to host us again next year. While you are marking this meeting in your diary, please also mark the also the International EISCAT Symposium (formerly "Workshop"), which will take place 12th to 16th August 2013 at Lancaster University, UK, kindly hosted by Mike Kosch. Now, you might be wondering what all this has to do with the photo above. It's Friday, and that means it's time for an image feature. It's also spring time in EISCAT-land, and the snow is melting very rapidly. Just before leaving for Uppsala, this photo was taken at the shore of Kitinen and shows the oldest building of the Sodankylä Geophysical Observatory, the sauna on the shore, completely surrounded by water. With the snow gone, we are looking forward to resuming the construction of KAIRA and all kinds of other developments of EISCAT_3D. With this we wish all of you a very good weekend! "Depending on the heterogeneity of the data and the dispersion of their sources, the scientists can spend a lot of energy and time just for searching, finding, treating and preparing the data before starting scientific analysis. In order to help the users to faster reach the data analysis and interpretation step, the CDPP is developing" the AMDA service. CDPP is the Centre de Données de Physique des Plasmas (Plasma Physics Data Centre). At the 4th EISCAT_3D User Meeting in Uppsala, we have heard an interesting talk by Hannu Koskinen (U Helsinki) on the Space Situational Awareness (SSA) programme of the European Space Agency (ESA). includes four elements, which are Space Surveillance and Tracking (SST), Near-Earth Objects (NEO), Space Weather (SWE), and Data Centres (DC). SSA is a service-oriented programme, not a research programme. Space surveillance radars exist already, and most are military facilities. Now new facilities are planned, with a monostatic radar in Spain and a bistatic system in France. While monitoring satellites is important, space debris has become a threat to space exploration, and space agencies are increasingly aware that space debris objects and their distribution needs to be monitored. One of the practical problems is that access to military space surveillance data is complicated. Within the Space Weather element, four expert groups are proposed on Solar Weather, Ionospheric Weather, Radiation Environment, and Geomagnetic Environment. What could be EISCAT's contribution to SSA? — The observation of small space debris particles has already been part of EISCAT's operations and it is anticipated that the new EISCAT_3D radar will very well be able to compete — or better: complement — other space debris monitoring systems. EISCAT will be very beneficial to space weather if one ensures, that experiments can be scheduled flexibly to react quickly to event alerts and warnings, and forward the observations immediately and efficiently to space weather partners. Hannu Koskinen pointed out that the life-time of current solar wind missions is limited (ACE, WIND), and the upcoming KuaFu mission, which is a joint proposal of China, Canada and Europe, will be well placed to fill this function. The plan is to launch three satellites, one of which will be located at the L1 point, i.e. the place where the gravity of Earth and Sun balance out, which then will monitor events like solar flares and solar wind shock waves. See also, e.g., the recent BBC Future article "Space junk: Why it is time to clean up the skies". Photo: Thomas Ulich, click to enlarge. Disclaimer: These notes are taken in real-time during the presentations at the EISCAT_3D User Meeting, so please get in touch if you find any errors and have any comments. You can also use the comment function of this blog. Thank you. From today, Wednesday, 23rd May 2012, scientists interested in EISCAT_3D are meeting in Uppsala, at the Ångström laboratory, for the 4th EISCAT_3D User Meeting. 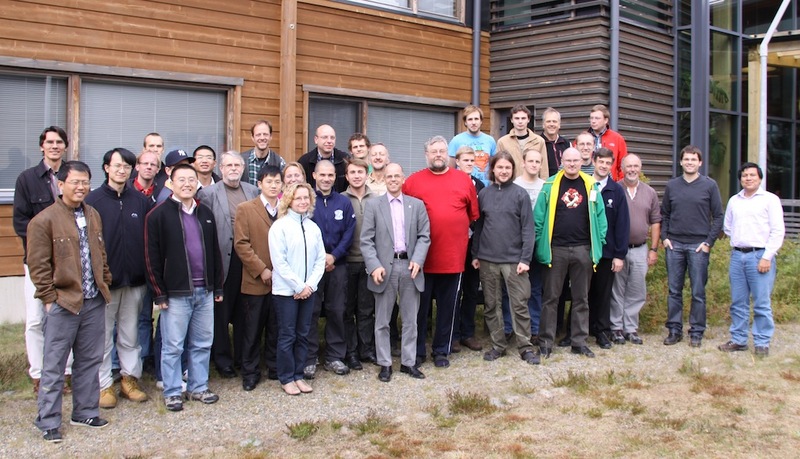 This meeting was organised the first time at the end of the FP6 EISCAT_3D Design Study in 2009, and it has become somewhat of a tradition by now to meet in Uppsala in May every year since. During this meeting, we will try to update you on what is going on. For a programme, please refer to the web page of the meeting. During this first day, the science case will be discussed, which is developed by WP3 of the current FP7 Preparatory Phase project. WP3 tackles the science case by addressing different science topics with dedicated teams. Currently the Space Weather topical range is being discussed. The WP3 leaders, Anita Aikio (U Oulu) and Ian McCrea (STFC/RAL) are starting the day with an overview of the current status of the science case discussion. Naturally, all users are invited to contribute to this. The Met Office is attempting to position itself as a leading space weather forecast centre internationally and also as the service delivery agency for space weather service within the UK. The Met Office has recently signed a Memorandum of Agreement with NOAA Space Weather Prediction Center over the joint development of space weather services and capabilities and is collaborating with the British Geological Survey, and other partners, in the UK. This post shall focus on the operational implementation of space weather models and customer products, in collaboration with UK and international partners. The primary initial goal of this post is to implement the WSA Enlil solar wind propagation model at the Met Office (in collaboration with NOAA), to transition this to an operational service that will provide alerts of arrival of Coronal Mass Ejections and associated advice to customers, and to further develop this service (eg by developing a WSA Enlil ensemble prediction service). To coordinate, develop and implement space weather services within the Met Office, in collaboration with partners, driven by a firm understanding of users needs. To gain and maintain a basic understanding of both space weather and the forecasting process. Identify, and either manage the implementation of, or directly implement, scientific models (e.g. WSA Enlil) and techniques to support space weather forecasting. Support the Met Office College or Lead space weather forecaster in the training of forecasters in new space weather forecasting techniques and models. Represent the Met Office on a number of scientific groups, working alongside other science and business colleagues. Write papers for publication in peer-reviewed journals, give presentations at international conferences and take part in relevant international collaborations and working groups, as appropriate, to raise the visibility and reputation of the Met Office in this field. Closing date for applications: 6 June 2012. For more information, please refer to the original announcement here. On the prediction of the auroral westward electrojet index, by O. A. Amariutei and N. Yu. Ganushkina, ANGEO, 2012, Vol.30, pp. 841-847, SRef-ID: 1432-0576/angeo/2012-30-841, http://direct.sref.org/1432-0576/angeo/2012-30-841. Propagation properties of Rossby waves for latitudinal β-plane variations of f and zonal variations of the shallow water speed, by C. T. Duba and J. F. McKenzie, ANGEO, 2012, Vol.30, pp. 849-855, SRef-ID: 1432-0576/angeo/2012-30-849, http://direct.sref.org/1432-0576/angeo/2012-30-849. The International Symposium on Solar-Terrestrial Physics (ISSTP) will be held from 6th - 9th November, 2012 at the Indian Institute of Science Education and Research (IISER) Pune, India. This meeting under the aegis of the SCOSTEP is expected to draw leading scientists from around the world in the increasingly important, interdisciplinary fields of Solar activity and its impact on life on the Earth. The meeting is expected to involve professional scientists as well as graduate students, and will have a mixture of invited and contributed talks and posters. Please visit http://www.iiserpune.ac.in/~isstp2012 for pre-registration. From: D. Pallamraju; photo: University of Pune, Wikimedia Commons. The 9th European Space Weather Week will take place at the Belgian Royal Academy of Sciences in Brussels, Belgium, from 5-9th November 2012. This meeting is being jointly organised by the Belgian Solar-Terrestrial Center of Excellence (STCE), the European Space Agency (ESA), the Space Weather Working Team and the COST ES0803 communities. The local organisation is done by the STCE. This event will build on the advances made during previous European Space Weather Weeks and preceding ESA Space Weather Applications Workshops. Now in its 9th year, the ESWW has grown into the main annual event in the European Space Weather calendar. This year's event will highlight key innovations in space weather research, applications and services. The meeting will also focus on current challenges and actions necessary in moving towards a sustainable European Space Weather infrastructure, able to meet the requirements of a diverse end-user community. The final session of the week will present the final results of the COST Action ES0803 "Developing Space Weather Products and Services in Europe." The meeting will centre on 7 open sessions addressing a number of topical themes. Furthermore, it is expected that the main sessions will again be complemented by a diverse range of splinter and business meetings covering topical themes. Sessions denoted a/b will run in parallel. Each session will be divided into an oral and poster session. Posters will be on show all week and the poster sessions will be spread throughout this time. The oral presentations will cover a range of scientific and application-related themes and will consist of both invited and contributed papers. Service user contributions are welcome and encouraged. Abstract submission is now open and will close on 30th June 2012. Early bird registration deadline is 5th October 2012. 5th November: The ESWW keynote lecture will take place prior to the welcome reception and will again address a topical subject given by a renowned expert in the field. 6th November: A scientific debate will take place following the day's normal sessions. This year's event will again include a space weather fair, where users and service providers will have the opportunity to interact in an informal working environment. For more information about these events, please check the conference website for regular updates at http://stce.be/esww9. From: Alexi Glover and Anna Belehaki. Plasma flows, Birkeland currents and auroral forms in relation to the Svalgaard-Mansurov effect, by P. E. Sandholt and C. J. Farrugia, ANGEO, 2012, Vol.30, pp. 817-830, SRef-ID: 1432-0576/angeo/2012-30-817, http://direct.sref.org/1432-0576/angeo/2012-30-817. On the role of ozone in long-term trends in the upper atmosphere-ionosphere system, by J. Lastovicka, ANGEO, 2012, Vol.30, pp. 811-816, SRef-ID: 1432-0576/angeo/2012-30-811, http://direct.sref.org/1432-0576/angeo/2012-30-811. Positive ionospheric storm effects at Latin America longitude during the superstorm of 20-22 November 2003: revisit, by B. Zhao, W. Wan, J. Lei, Y. Wei, Y. Sahai, and B. Reinisch, ANGEO, 2012, Vol.30, pp. 831-840, SRef-ID: 1432-0576/angeo/2012-30-831, http://direct.sref.org/1432-0576/angeo/2012-30-831. Further information on space physics research in Uppsala can be found at http://www.irfu.se. For further information please contact Dr Yuri Khotyaintsev (yuri -at- irfu.se) and Dr Andris Vaivads (andris -at- irfu.se). Trade union representative is Elisabeth Dackborn (elisabeth.dackborn -at- irfu.se). Candidates should have completed a PhD during 2009 or later. Candidates planning to obtain their PhD degree no later than September 2012 can also apply. If the candidate has an older degree and wants to refer to special circumstances, such as parental leave, this should be clearly stated. The candidate should not currently be an active researcher at the Swedish Institute of Space Physics in Uppsala or the Department of Physics and Astronomy at Uppsala University, Sweden. The position is available at the Uppsala office of the Swedish Institute of Space Physics, located at the Ångström Laboratory in Uppsala, Sweden, from the second half of 2012 for one year with a possibility of extension. Closing date is June 4, 2012. Applications should include a CV, a short letter stating the applicant's research interests and relevant experience, copies of undergraduate and PhD degree certificates (or a letter from the supervisor stating the date when the PhD degree will be obtained), description and proof of previous post-doctoral positions and/or similar relevant research work (if available), names and contact information for two professional references, and reprints of not more than 4 selected publications. Applications shall be sent to: Registrator, Swedish Institute of Space Physics, Box 812, SE-981 28 Kiruna, Sweden, or by email to: registrator -at- irf.se (Tel. +46 980 79061). Reference: Dnr 32-83/12. From: Eivor Jonsson; photo: Wikimedia Commons. Submissions are now being accepted for a special issue of the Journal of Atmospheric and Solar-Terrestrial Physics, highlighting recent advances in our understanding of ice layers in the region of the mesopause and the environment in which they form. In addition to the papers presented at the 10th International Workshop on the Layered Phenomena in the Mesopause Region (LPMR) in Blacksburg, Virginia on 24-27 October 2011, we invite all relevant papers from the community. The submission website for the journal is located at: http://ees.elsevier.com/atp/default.asp. Remember to select "10th LPMR" as the 'Article Type' in the submission process. Deadline for submission: 21st May 2012. Guest Editors: Dr Scott Bailey, Mr. Matthew DeLand, Prof. Franz-Josef Lübken, Dr James Russell, Dr Wayne Scales, Dr Brentha Thurairajah. From: Brentha Thurairajah, Virginia Tech. It seems the winter is making one more concerted effort to keep its grip on "EISCAT land." This morning, after a very sunny Mayday, we awoke to heavy snowfall. Spring in Lapland, polar day and fresh snow! The photo shows the Sodankylä EISCAT site this morning at 09.00 h local time (2012-05-02). 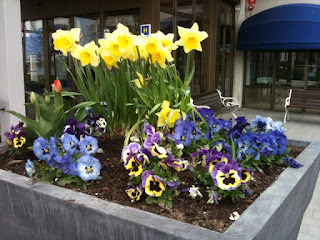 Have a nice spring, whereever you are! Photo: Thomas Ulich; click for bigger image. The emission of oxygen green line and density of O atom determined by using ISUAL and SABER measurements, by H. Gao, J.-B. Nee, and J. Xu, ANGEO, 2012, Vol.30, pp. 695-701, SRef-ID: 1432-0576/angeo/2012-30-695, http://direct.sref.org/1432-0576/angeo/2012-30-695. A remarkable correlation between short period gravity waves and semiannual oscillation of the zonal wind in the equatorial mesopause region, by N. Venkateswara Rao, T. Tsuda, and Y. Kawatani, ANGEO, 2012, Vol.30, pp. 703-710, SRef-ID: 1432-0576/angeo/2012-30-703, http://direct.sref.org/1432-0576/angeo/2012-30-703. Magnetic field amplification in electron phase-space holes and related effects, by R. A. Treumann and W. Baumjohann, ANGEO, 2012, Vol.30, pp. 711-724, SRef-ID: 1432-0576/angeo/2012-30-711, http://direct.sref.org/1432-0576/angeo/2012-30-711. Global propagation features of large-scale traveling ionospheric disturbances during the magnetic storm of 7-10 November 2004, by Q. Song, F. Ding, W. Wan, B. Ning, and L. Liu, ANGEO, 2012, Vol.30, pp. 683-694, SRef-ID: 1432-0576/angeo/2012-30-683, http://direct.sref.org/1432-0576/angeo/2012-30-683. Experimental evidence of the simultaneous occurrence of VLF chorus on the ground in the global azimuthal scale ? from pre-midnight to the late morning, by J. Manninen, N. G. Kleimenova, O. V. Kozyreva, M. Parrot, T. Raita, and T. Turunen, ANGEO, 2012, Vol.30, pp. 725-732, SRef-ID: 1432-0576/angeo/2012-30-725, http://direct.sref.org/1432-0576/angeo/2012-30-725. Bounce-averaged Fokker-Planck diffusion equation in non-dipolar magnetic fields with applications to the Dungey magnetosphere, by B. Ni, R. M. Thorne, and Q. Ma, ANGEO, 2012, Vol.30, pp. 733-750, SRef-ID: 1432-0576/angeo/2012-30-733, http://direct.sref.org/1432-0576/angeo/2012-30-733. Evolution of the plasma sheet electron pitch angle distribution by whistler-mode chorus waves in non-dipole magnetic fields, by Q. Ma, B. Ni, X. Tao, and R. M. Thorne, ANGEO, 2012, Vol.30, pp. 751-760, SRef-ID: 1432-0576/angeo/2012-30-751, http://direct.sref.org/1432-0576/angeo/2012-30-751.